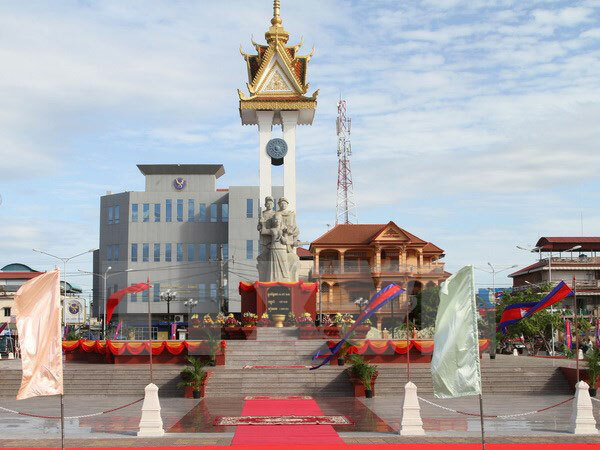 The Vietnam-Cambodia Friendship Monument and the Independence Tower were inaugurated in Cambodia’s Kompong Chhnang province on January 3. Attending the inauguration ceremony were Kompong Chhnang Governor Chhu Chan Duon, Acting General Secretary of the National Council of Solidarity Front for the Development of Cambodian Motherland Nhem Valy, and Lieut. Gen. Do Can, Vice Chairman of the General Department of Politics under the Vietnam People’s Army. Addressing the event, Chhu Chan Duon said that the people of Kompong Chhnang province and Cambodia as a whole are always grateful to the Party, Government, army and people of Vietnam for saving Cambodia from invaders and Pol Pot genocide regime. Meanwhile, Nhem Valy stated that the works show sound cooperation between the National Council of Solidarity Front for the Development of Cambodian Motherland and the Vietnamese Ministry of National Defence. They also mark the 50th anniversary of the Vietnam-Cambodia diplomatic ties. For his part, Lieut. Gen Do Can said that the Vietnam-Cambodia Friendship Monument, which is also built in various localities of Cambodia, has significant historical and cultural values. It is a symbol of warm sentiments, solidarity, bravery and sacrifice of people and armies of Vietnam and Cambodia. It is also a thankfulness to volunteer Vietnamese soldiers and those of the Cambodian Royal Army who laid down their lives for independence, freedom and prosperity of both nations. The Vietnam-Cambodia Friendship Monument was inaugurated when people of both countries were celebrating 38 years of victory against Pol Pot regime, saving Cambodia from the genocidal catastrophe. The monument was first built in 1989 on the occasion of 10 years of victory against Pol Pot regime. It was upgraded in 2016 with an investment of 350,000 USD from the Vietnam Fatherland Front Central Committee./.